Thank you for sharing! That's an amazing army! Now that is an impressive looking battle. Hey I need to see a picture of that big thing in the background? 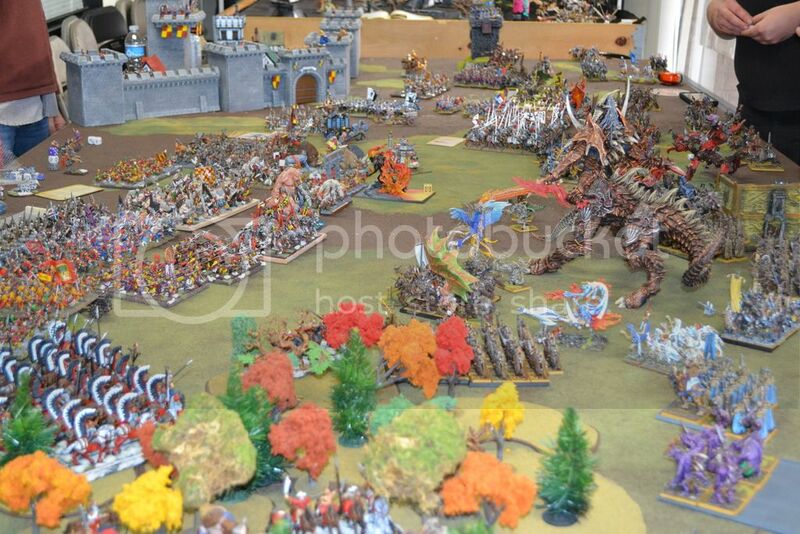 The Breaking of Kislev looks amazing, I would love some more close-ups! 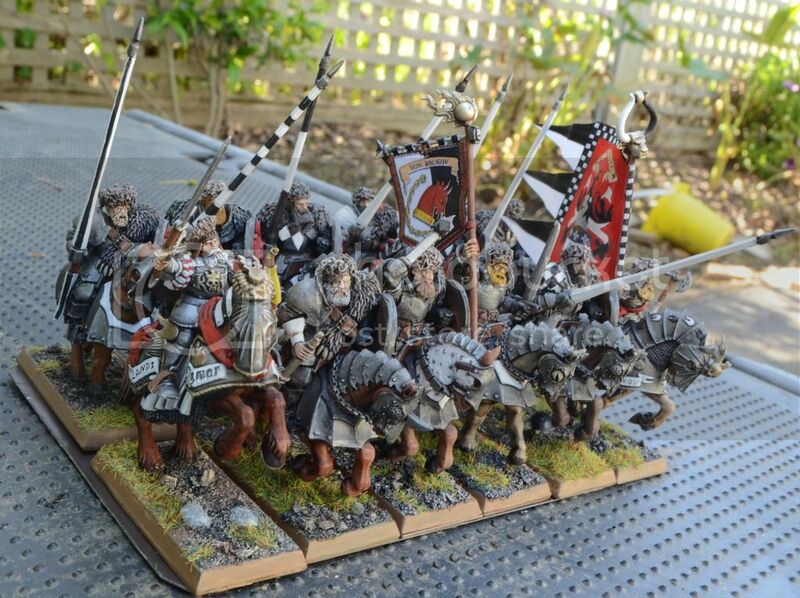 Beautiful army you have, I am impressed that you manage to pull of a project like Volganof! Bravo! you mean this guy facing some very brave (and very foolish) handgunners? Greetings everyone, time for an update on my slow march to Volganof. But, before we go there and since I derailed this thread so thoroughly with pictures of our last big game why not more off-topic material. We’ve played a little bit of Mordheim around here and I will say, it is not a bad game. Longer term I would miss the grandeur of titanic battles but it was a nice change of pace. I played a Norse warband, lead by Olaf, the thoughtful. Here he is, contemplating his next move. And this is the rest of the gang. Their outing in Mordheim wasn’t wildly successful (seems to me the single most important thing is how lucky one is on the injury recovery rolls) but, they certainly will bring back to their hearths in Norsca tall tales of gore and glory. Right, now let’s get this project log back on track. Most on my effort lately was on building and painting the Raukov Household Knights. As you may remember Elector Count Valmir von Raukov (together with a ‘few’ Reiksguard) will turn up at the eleventh hour attempting to save his sons and his city. I imagined he should be escorted by his personal retinue and so I cooked up these guys. 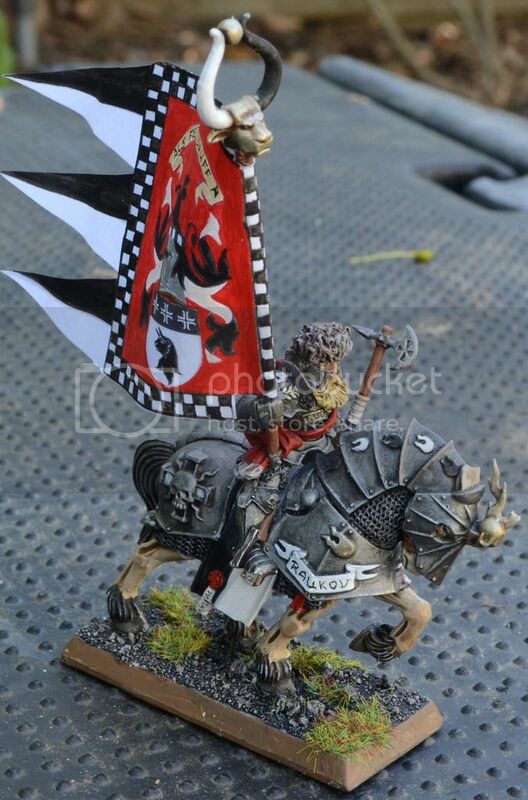 Obviously based on the old chaos knights with some Empire lances and heads. I quite like how they turned out. My favorite part is how the horse heads can be de-chaosified and then break up the typical monotony of these tired old plastic horse sculpts. If I could do it again, I would do the banner a little differently. It’s too small and if you look too closely at the way its set up you will realize that it is rather impractical. 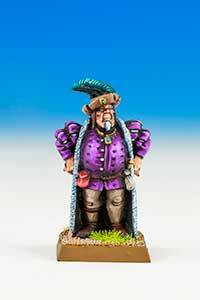 But, eventually there will be a BSB in the unit as well so then it might be nice if the unit standard is more modest. 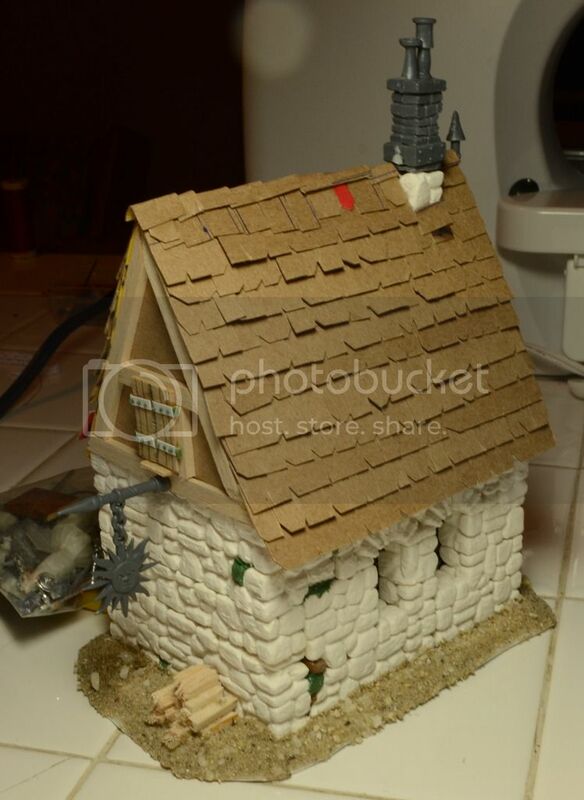 Also, I wanted to give you an update on the first hovel of Volganof. This is the other side, it’s complete now, awaiting paint. It’s been a while since I painted a building. Any pointers? They do indeed look good. Anything that breaks up the look of the basic plastic Empire knights is a good thing, really. Seriously, I'm not sure what kind of pointers you mean considering your excellent paint jobs in this blog. Excellent work on those knights BTW! I have been looking to that unit for 10 or 15 minutes it is a real joy to look at. 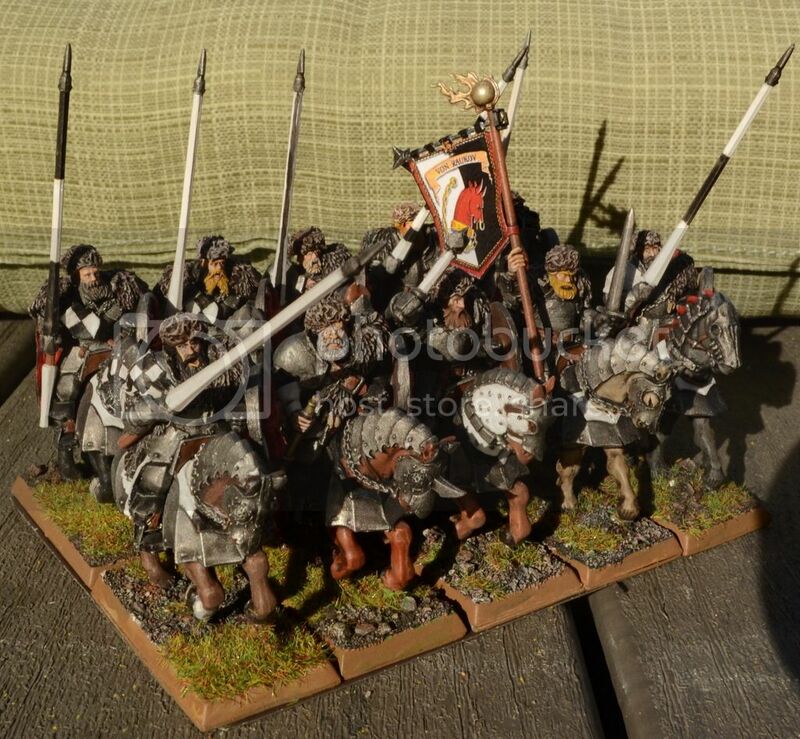 The conversion work done on the horses is small but effective, choice of models is excellent, paintjob is superb although the lance pole with the stripes looks a bit hurried. Still overall impression is: that was enjoyable. There is a lot to see on that unit. Each knight, although in the same colours has a different colour scheme. The only thing binding them as a unit are the shields. I would expect from a knightly order that at least the weapons handed out to them would be uniform. 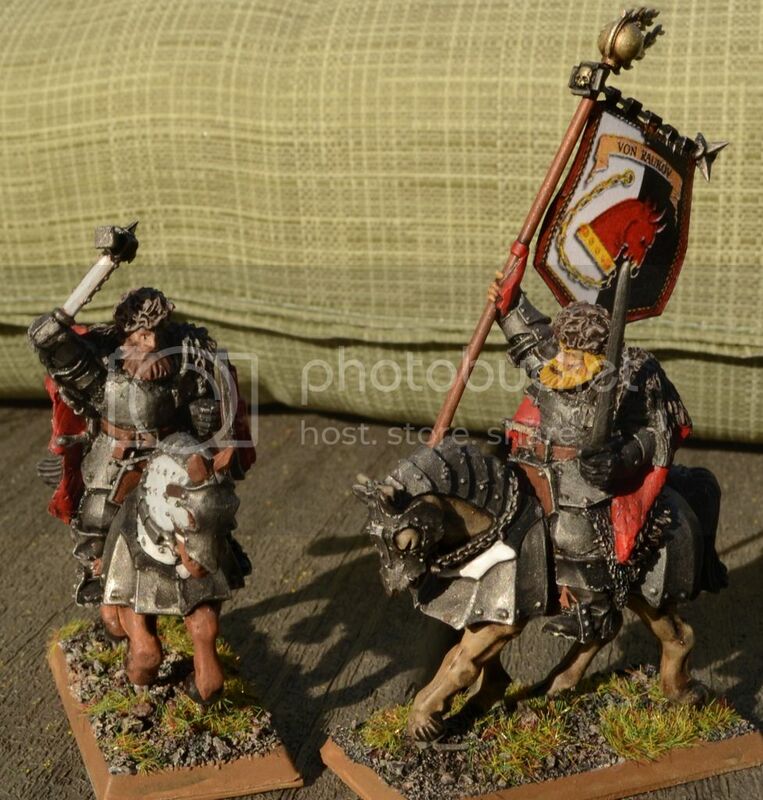 In the knightly order set there is a possibility to add small streamers (little triangle shaped banners) to the lance poles. I think a smalll touch to improve might be painting the lances in one colour scheme and the streamer on the lance could be the bright red? -First thought on the lances: the horizontal stripes? I like the stripes because they remind me of the black and white checker motiv all over the unit. These stripes should although be on all lances equal in shape/width. -second thought on the lances: The overall black and white checkers and the metall colour of the armour could make the overall look off the unit turn into one white/grey/blackish blurr. 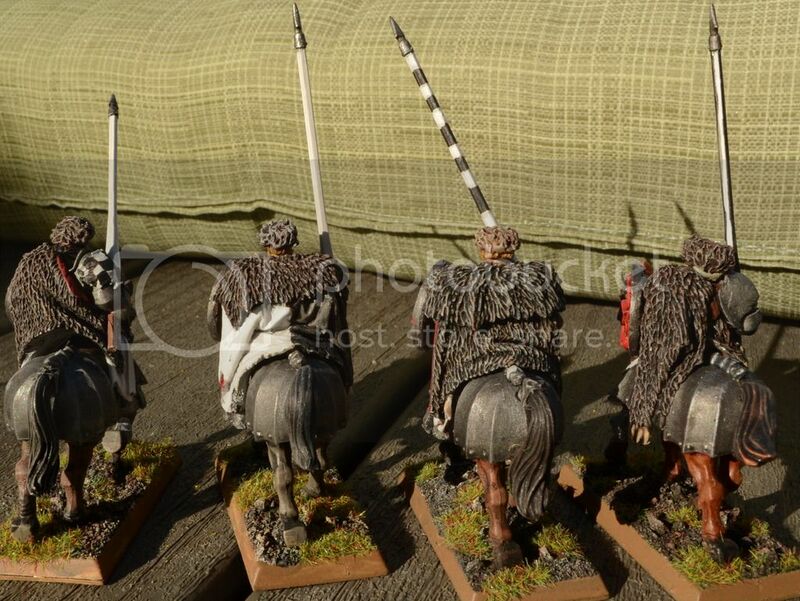 Maybe doing the lances in a warm wooden colour would be more effective to let the Lances stand out, together with a red streamer. I hope me being direct does not bother you to much dear Sir. I've been reading the entire blog and clearly there some people here who enjoy the hobby in the same way: epic battles, historical background, lagre painted armies and awesome scenery. Congratulations for your efforts. Keep it on! 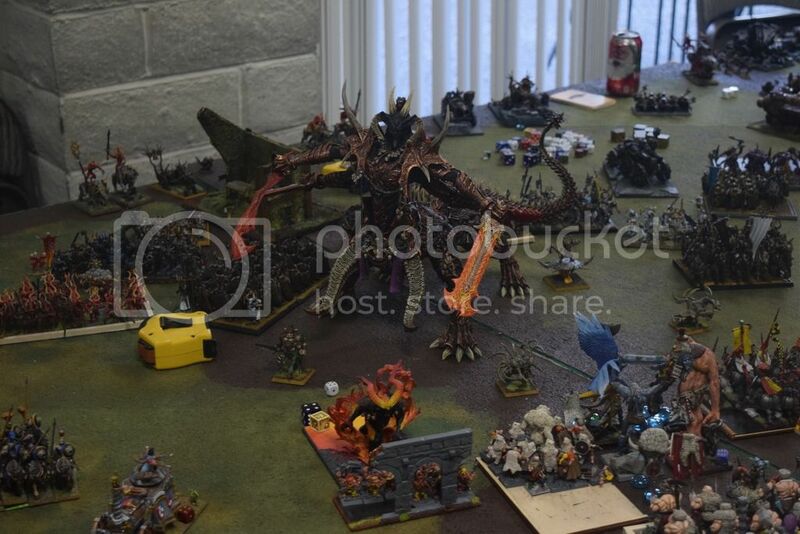 May I ask what the model for this giant Krankarok the Black? He clearly ridicules my Kholek Suneater...! Excellent stuff going on here! I see one of the lances painted in black and white length wise. That is thge only other one I've noticed done that way, outside of an older general on a griffon that I gave a lance to in making him. His lance is painted black and yellow along its length, and my figure represents one of my Averland characters, a mercenary commander named Heinrich von Furstenburg. I really like the knight conversions and painting. Perfectly fit the theme. Thanks for the battle shots -- awesome looking game! thanks for taking the time to comment, guys! 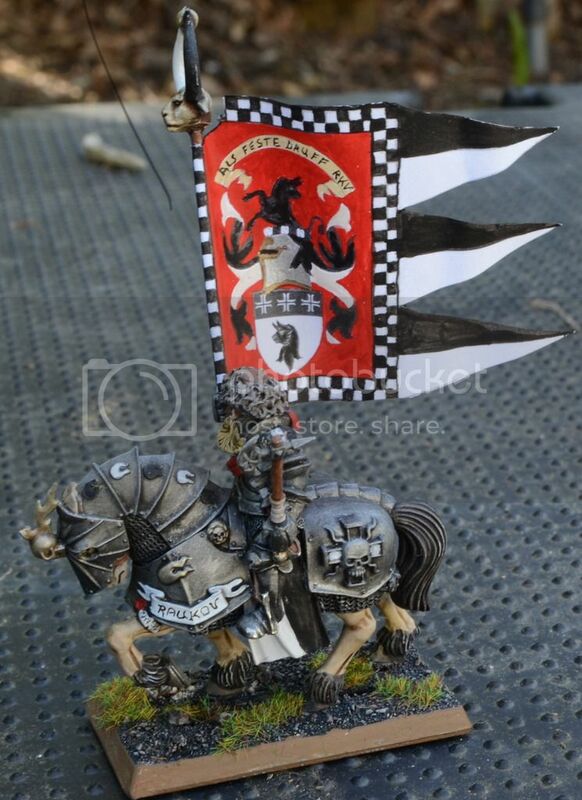 and yes on top of my GW grievance list is that they never updated the knights. They had the technology... Also, 'large brush' check! Don't take it personal, he ridicules everyone. See the guy to the right of the tape measure? That's a regular dragon ogre. I think at this point the shaggoth had already left the field with an inferiority complex. Legend says Krakanrok is the size of the mountain and when he wakes it would be the end of the world. so, they only exaggerated the mountain part, and not by much. The model is based on something from here: http://www.resin-kit.com/ but then rather extensively converted. ...and I had nothing to do with it. 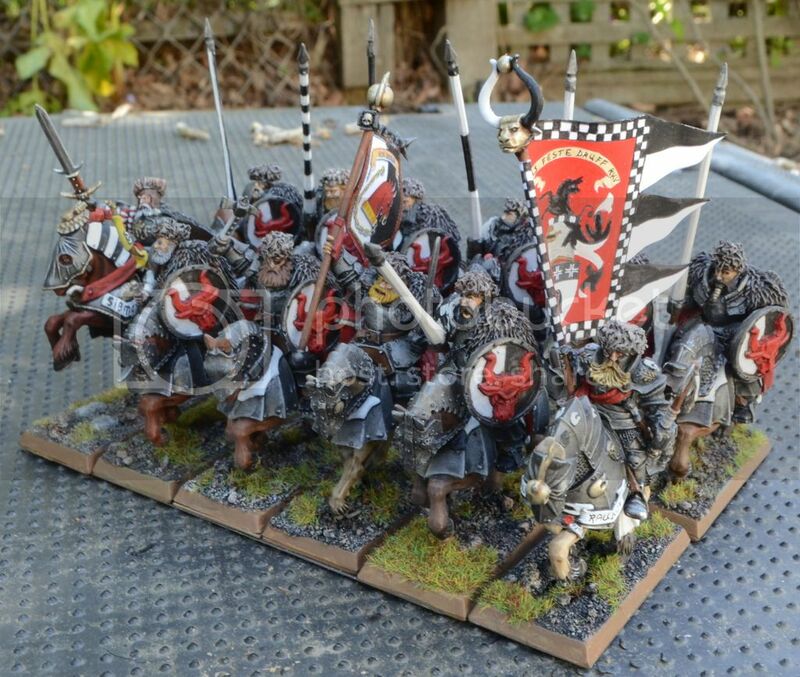 I've looked at your Altdorf blog before, and now am following the Kislev effort. Great stuff, you are well on your way to making it into my personal hall of hobby fame! wow, thanks Henerius for sharing your thoughts. I will check out the building links. And NOT provide close ups of the Mordheim gang. They wouldn't stand up to it, just a quick and dirty job to have a gang to play with. Now regarding the lances. I really didn't know what to do with them. As I was painting up the models I tested different patterns. Not too excited about any of them. So, in the end I just left them all as is and thought I could get away with it. But, you won't let me. Thanks for keeping me honest. So, what to do now. The streamers are a great idea but, since my models by and large come from bargain bins and ebay lots I am chronically short on those, few people seem to bother sticking them on...or they fall off before I get my hands on the models. 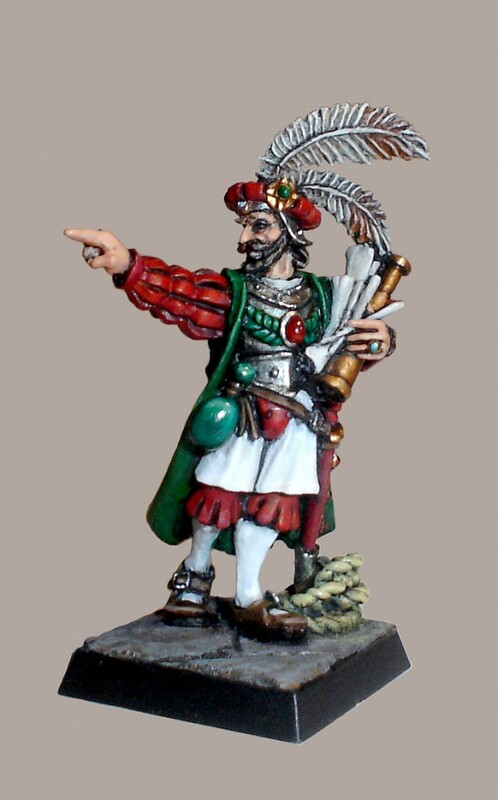 All streamers I have in my bits box are earmarked for the upcoming unit of Reiksguard (The Reiksguard style manual, 18th edition, Altdorf Press 2367 clearly states that every knight needs to affix a gleaming red pennant before the first charge). 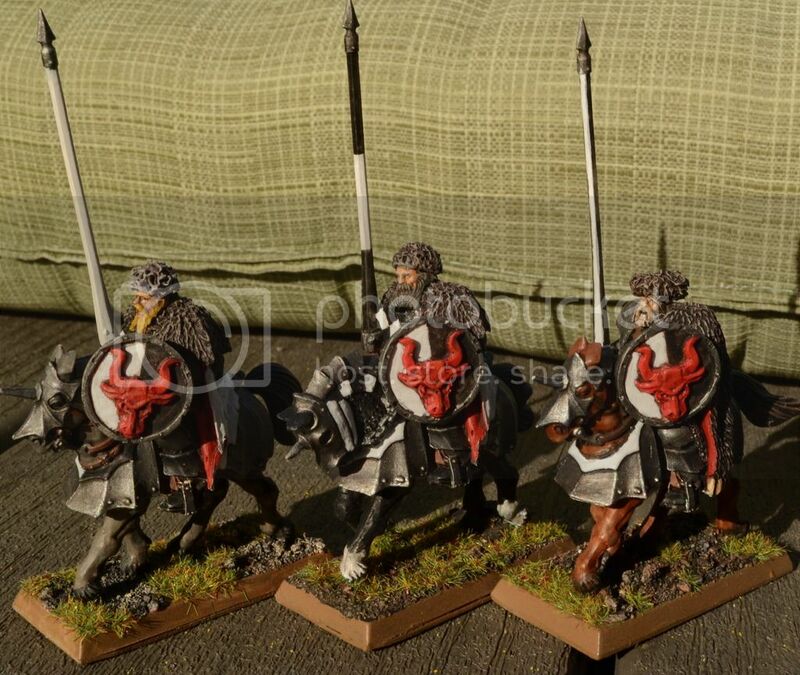 I guess I could still incorporate some red into the lance or make them brown but, I want to make sure there is enough black-white in the models to make them recognizably Ostland. Anybody want to weigh in (preferably with a strong opinion)? Greetings, everyone. I am spending most of my painting time these days on a rather substantial unit of Greatswords. About halfway through at this point but on the side I have finished up the BSB to go with the Raukov Knights so that’s what is on the menu today. I present to you Marek von Raukov, Banner Bearer of Ostland. Marek is from a cadet branch of House Raukov. While his appointment was originally an old favor his father called in from the Elector Count, Marek has proven himself a worthy Battle Standard Bearer. At Valmir’s side he has hunted down beastmen and chaos cultist all across Ostland and beyond. He took part in the punitive expedition to Norsca the year prior and distinguished himself there in the Battle of Cragmuire where he kept the banner flying despite a serious injury until victory was achieved. Marek had recovered his strength just in time to follow Valmir von Raukov south into the Empire and now he is back with the Household knights arriving just in time to tip the scales of Volganof’s fate. Here is the complete unit of knights with Valmir and Marek as they will ride to the defense of Volganof…one day. I was thinking I could hide his bald head under a nice floppy hat, add a sheathed sword and greenstuff the cannon balls into a rock. But, it seems hard to convert that hand with the little tool and the beard will make him look old even if I don’t paint it grey. Anyone have a better suggestion for Vassily? Some kitbash I am not thinking of maybe? I just don’t know how I could pull off the portliness. 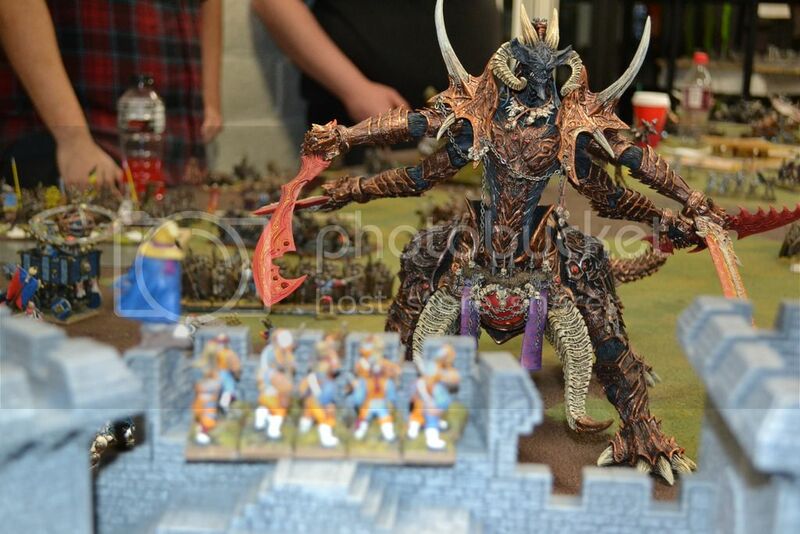 That daemon is HUGE! 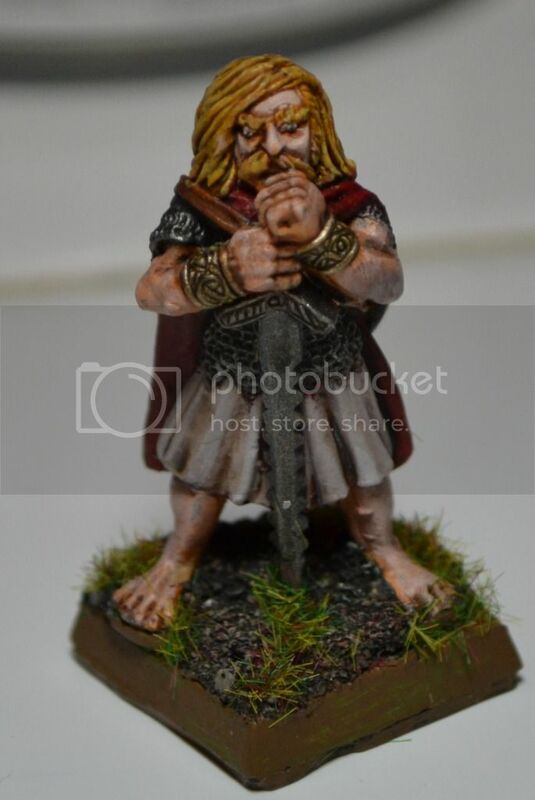 Really great stuff in this thread... painting, models, game play! Love the knights unit and its conversions, especially the BSB. Fantastic BSB! I really like this unit. - changing the head of Leonardo for another younger. This is not easy, I know, but is cheap. - using Marco Colombo model. Not extremely expensive around here (about 20-30 euros). Thanks for all your comments guys! I had thought of Marco Colombo as well but, I am more looking in the 2-3 dollar range. so he's out baring some lucky flea market find. One of the old Elector Counts might do. I'll have to look into that. Thanks. My only concern is that none of them are corpulent enough...at least that's how I picture Vassili. The Kislev Boyar is too warlike. 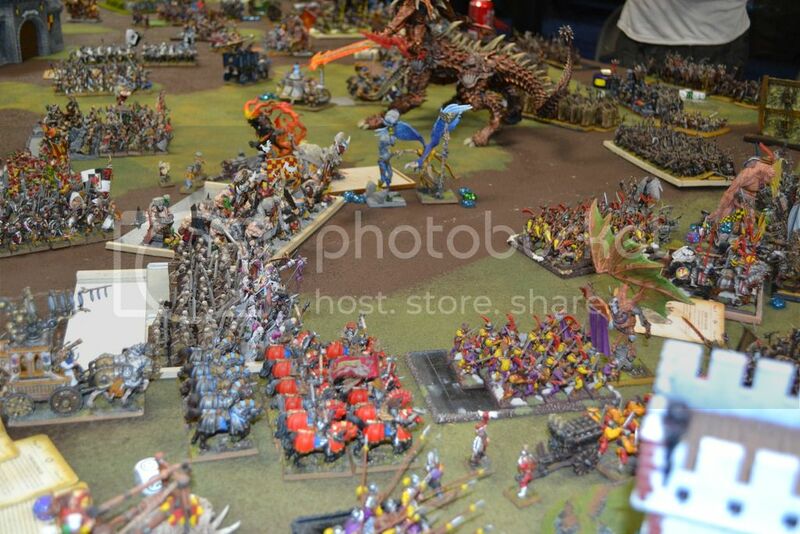 Coming to think of it, there just aren't too many overweight warhammer models (outside the ogre range). Coming to think of it, there just aren't too many overweight warhammer models (outside the ogre range). 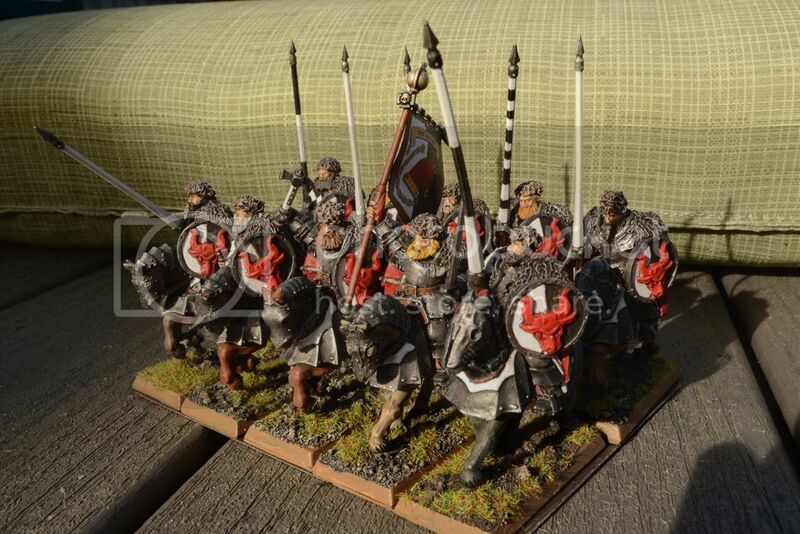 Superb BSB and unit of heavy cavalry. Creative conversions! Thanks, Stareso! I am working through a substantial greatswords. it has become a test of stamina, turns out I don't have too much at the moment. But, it will get done eventually and then I'll do a proper update. I had missed this gem of advice. This guy has potential if I can put on puffy sleeves and maybe something else around the shoulder/neck area.